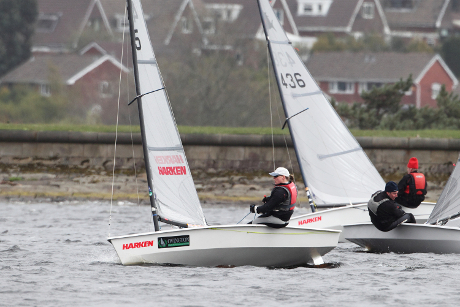 The 2015 Travellers Series consisted of 6 events with 4 to count, at least one of which had to be the Inlands(Bala), Nationals(Tynemouth) or Ovington Championships(Grafham). 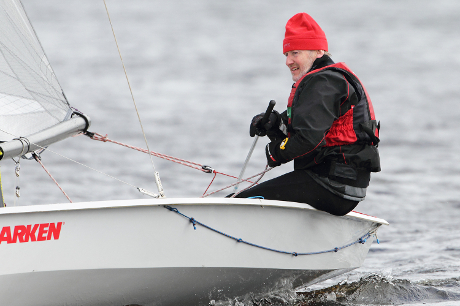 Unfortunately Grafham was cancelled by the organisers due to storm Abigail, which forecast 40mph winds. With the exception of Oxford all the events experienced F4+ winds. Kevin's consistency at the Nationals and Inlands ensured he finally regained the Travellers Trophy, beating Martin by just 1 point. The Solution fleet was treated to the best that Bala SC had to offer over the weekend of 19/20 September. Both mornings, the fleet was greeted with the stunning sight of a perfect image of the Snowdonia scenery reflected in the lake and both days, the wind filled in a short while later treating us to a steady 15mph or so South Westerly. On Saturday, new boy Christian Smart followed up his 2014 guest appearance by posting 2 bullets in the two races with Nathan Batchelor chasing hard for two 2nds. The rest of the fleet divided into 2 groups with 5 boats having a good claim on 3rd place and 3 boats within equal shout of 8th. Sunday dawned with a few sore heads from the Bala beer. Nathan managed to secure a win in the first race pushing Christian down to 2nd. Kevin Clark took advantage of the hangovers in the remaining two races using his clear head to take first place in both. Nathan managed to hang onto 2nd in each but Christian held onto 3rd which was enough to give him the event on countback. 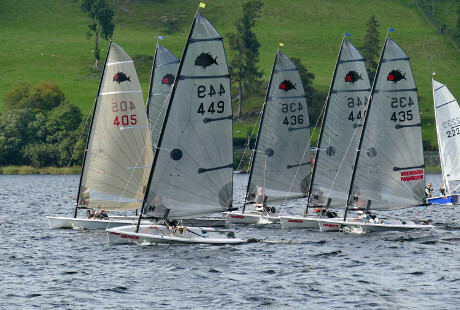 The rest of the fleet carried on with their two battles ensuring that everyone had great racing and great competition. Huge thanks go to Bala SC for accommodating the last minute venue change and to Harken and Ovington for once again providing generous prizes. A South Easterly F3 greeted the competitors at Oxford for 3 races alongside the Lightenings. In Race 1 Martin got a port tack start to reach the top mark first, but a lack of attention meant he nearly sailed the wrong course and was caught and passed by Mitchell. Race 2 was held after lunch. Martin again got away first, and although he sailed the correct course Mitchell again just took first place on the reach to the finish line. At the third attempt Martin got the win in race 3, but with a discard Mitchell took a well deserved first place. 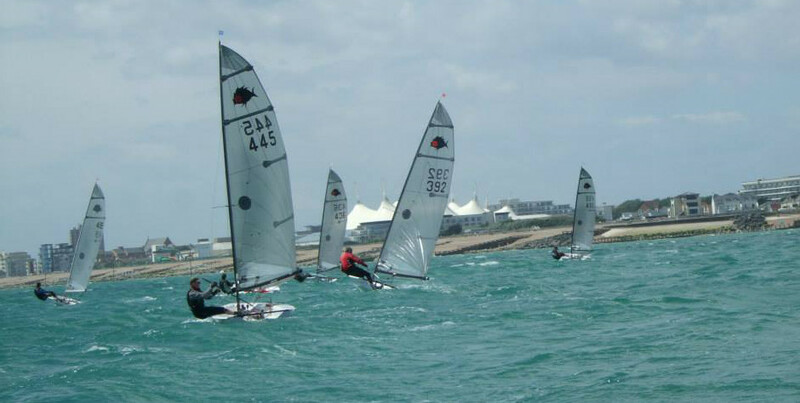 The Solution National Championships were hosted by Felpham Sailing Club on 27 and 28 June. 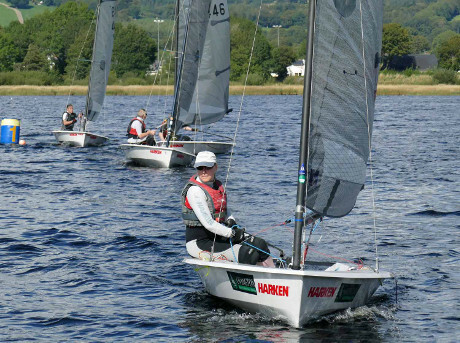 13 sailors were greeted with near-perfect sailing conditions of glorious sunshine and steady breeze. Race one started with a steady 14 knots of wind. Mitchell Campbell, Peter Fisk and Ross Prytherch made the best of the start all rounding the first mark in front of the chasing pack. On the second beat Kev Clark and Sam Davy headed right out to the right making the best use of the tide. Kev rounded in the lead and Sam was third behind Mitchell and they followed that way until the last downwind mark where a mistake by Mitchell allowed Sam through to take second. Race two saw Sam Davy take the lead from Kev Clark with Martin Tubb following close behind. Kev manage to get past Sam on the second beat and held on to the end with Martin chasing Sam hard but he was unable to get past. By the time race three came the wind had built up to 22 knots and was going against the tide making for some rough conditions and had whittled down the numbers to those who really wanted to be out there. Once again Kev Clark took the lead from the start and lead everyone around till the end. Jack Turnbull came second from Martin Tubb in third. 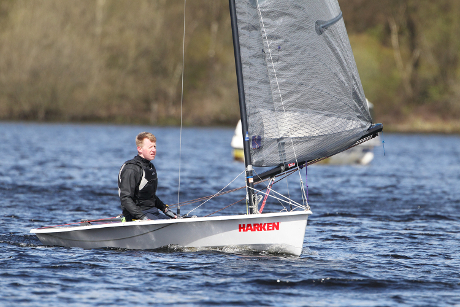 While Kev Clark had a clear lead in the championships overnight, the rest of the places were all to play for with Sam Davy on 12 pts and the next 6 boats on 15 or 16pts. Sunday dawned and the wind was considerably calmer than it had been on Saturday, enticing more of the fleet back on the water. Races 4 and 5 were held back to back with Sam Davy taking a clear lead in race 4, finishing ahead of Mike Gower in 2nd and Jack Turnbull in 3rd. 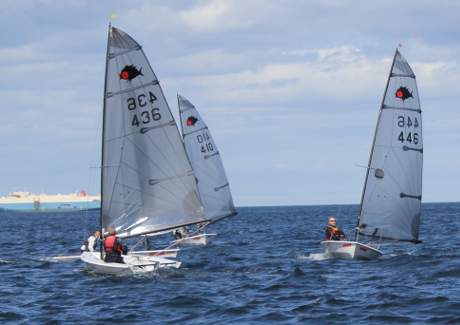 Race 5 was Mike's while Jack, finding his form on the sea, finished 2nd ahead of Mitchell Campbell in 3rd. 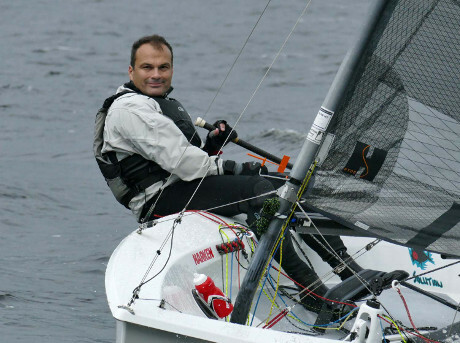 Kev Clark put in 2 miserable results, which he blamed on his impatience for sailing in light winds. Over the lunch break, there was a lot of head-scratching over possible result combinations; with 2 discards and extremely close points, the whole championship was now wide open. 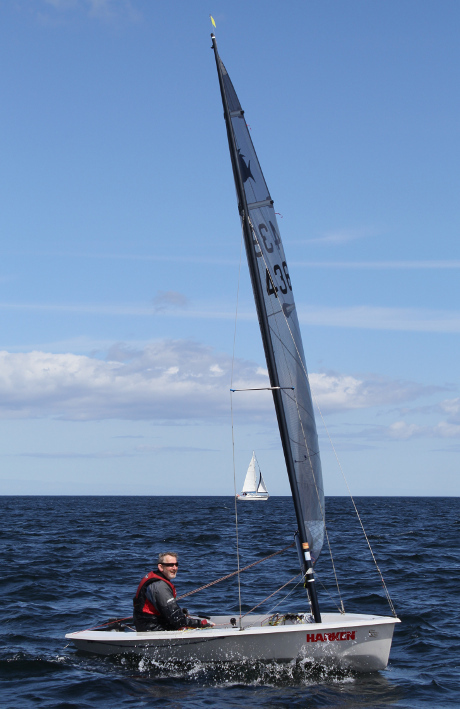 Luckily for Kevin, the wind built while the fleet was ashore making the final race more nail-biting. With everything to play for, everyone wanted to be first over the line, resulting in the first ever general recall at a Solution class nationals. The race officer was under time pressure to get the race away which was managed at the second attempt. Kev Clark and Sam Davy duelled hard, leaving Jack Turnbull to take the lead, which he held to the finish. Kev managed to break away into 2nd leaving Sam to come in 3rd, marginally pipping Mitchell Campbell into 4th. Overall, this was enough to secure the Championship for Kev and meant Jack sneaked past Sam into second on count back, giving him the Youth prize ahead of Mitchell too. 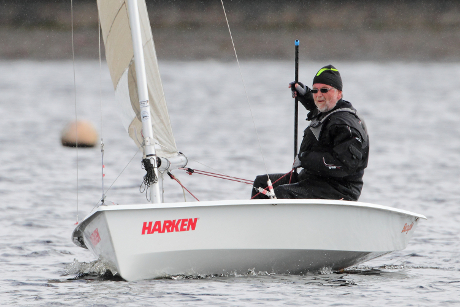 Mike Gower won the Masters trophy while Peter Fisk took home the Ted Funnell Memorial trophy for finishing mid-fleet. Thanks go to for their generous sponsorship which gave prizes to everyone in the fleet. Felpham Sailing Club hosted a cracking event and the whole fleet is looking forward to returning in the future. The Ted Funnell Memorial Cup was won by Peter Fisk for finishing mid fleet. Again a port bias start for the fleet and a little chaotic in the strong wind with only Peter and Sam getting off the line well. Sam lead again at the first mark but Martin was close after the first lap, overtook him on the second down wind reach and held onto the 1st position til the end. 3rd & 4th changed positions on each lap with Karl eventually coming out on top and taking 3rd again with Peter in 4th. Niall took a bang to the head and had to retire. Close racing between all 5 Solutions in this race until the last lap when Sam and Martin left the rest of the fleet behind. 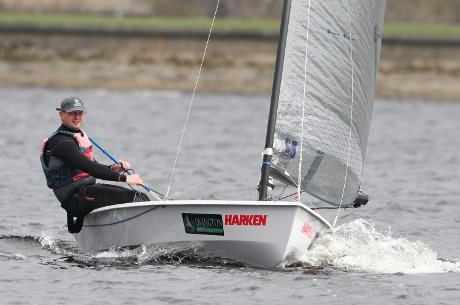 Local sailor Liam Alcock, who had taken over the helm of Niall's boat, held 3rd place until a foot strap broke on the last downwind leg which allowed Karl through for his third 3rd place. Liam got upright and finished 4th with Peter taking 5th. Winds gusting 30 knots reduced the 5 launched boats to 3 at the start. Peter and Martin decided the trip between the Piers looked a little daunting, which it was with wind against tide causing some horrible chop at the harbour entrance. 3 boats went off at the start with Karl heading right and reaching the windward mark 1st. 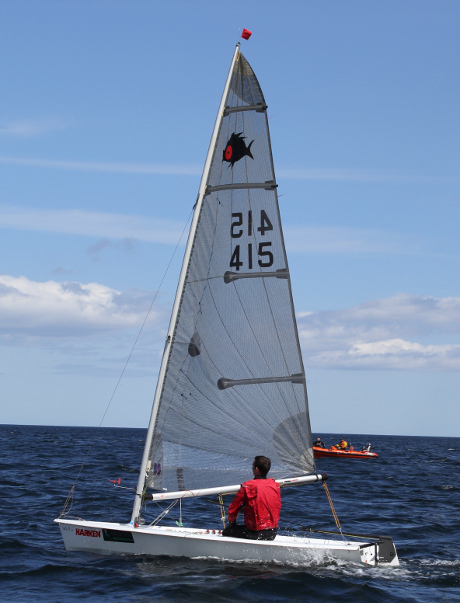 Liam, still sailing Niall's boat, capsized at the 2nd mark and never recovered. With Sam going over at the 3rd mark, also not to recover due to the increasing wind, this left Karl to complete 1 lap and take the hooter for 1st. For the first open meeting of the Solution calendar, the home boats and visitors arrived at Delph to a dark sky and April showers, however a quick brew and natter in the club house and this blew over to leave a dry and bright spring day. We had the water to ourselves apart from the Phantoms who had the first start and generally kept out of our way! Kevin Clark revelled in the F4 south westerly breeze and took the lead in race 1 with Martin Tubb leading the chasing pack. The second upwind leg was in the lee of the trees in the south west corner, leading to very light and fickle conditions. In the contrasting conditions the pond sailors came to the fore, catching and passing Kevin. The lead changed minute by minute with most of the fleet having a go at the front. At the final leeward mark, new comer Roger Postbeschild from West Oxfordshire rounded first with Martin on his transom. 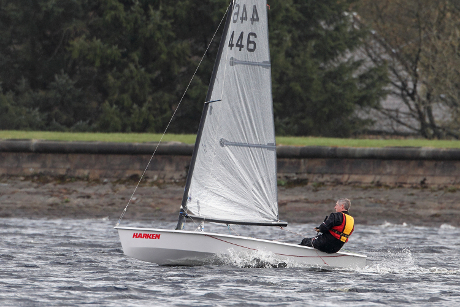 Roger went left up the final beat, towards the club house while Martin stayed right and managed to get the win by a few boat lengths and Kathryn Hayfield taking a solid third place. 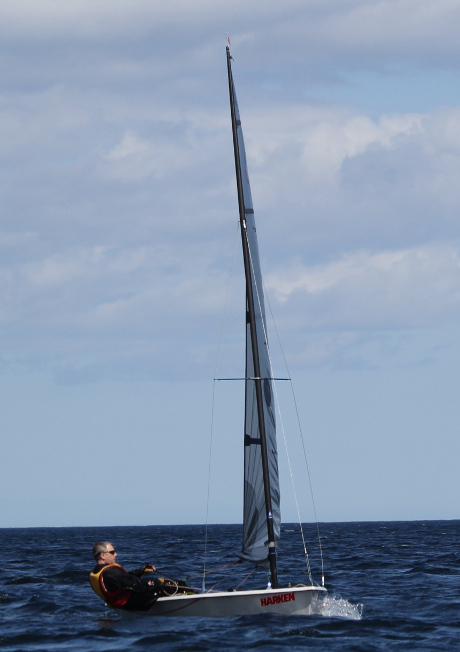 Race 2 was after lunch, and the wind has swung slightly to the west, giving more consistent conditions. Kathryn, Roger and Martin were leading on the first downwind leg, before Martin went for a swim after letting off too much kicker with a raised centreboard. This left Martin at the back behind Kevin, with Peter Fisk and Mark Crowther battling for mid fleet places. 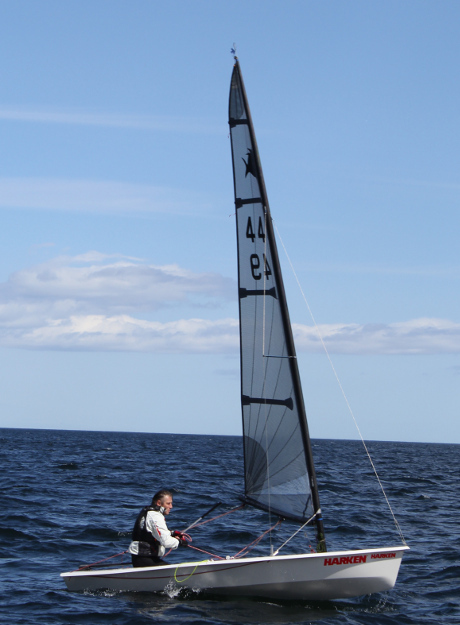 Peter has recently swapped from the full to flat cut sail and was slowly adjusting to differences in the trim. Roger capsized at the gybe mark, and the slightly increased wind strength allowed Kevin to take the bullet. Martin pulled back from his earlier mistake and just pipped Kathryn to second by less than half a boat length. Afternoon tea and cake were served in the clubhouse and after 2 long races this was well received by all the sailors. With a win each, and one discard, the third and final race was to be the decider between Martin and Kevin. Martin got a good start and sailed a blinder of a first beat to have a sizeable lead. Kevin was always ready to take advantage of any mistakes but Martin held onto the lead with Kevin having to settle for second place, and Peter taking third place.